Welcome to the 2018-2019 season. For those who are contemplating taking up ice hockey officiating, you are invited to join our family of just over 700 Connecticut officials. For returning officials, we're glad to have you back. Returning officials, your 2017-2018 certification will take you through November 30, 2018. After that date, you MUST be fully certified for the 2018-2019 and have your USA Hockey crest before you can officiate again. New officials, you cannot officiate games until you are fully certified and have your USA Hockey crest. Registration for the 2018-2019 season closes at midnight on March 15, 2019. Registration and certification requirements can be found on the USA Hockey web site. Note that when you have completed all your certification requirements (seminar, online modules, open book test, closed book test for levels 2-4, ice test for level 4, and background check and SafeSport certification if older than 17 years), you will need to be a member of one of the six organizations in the state that assign games to officials. The officiating organizations generally service specific geographic regions. 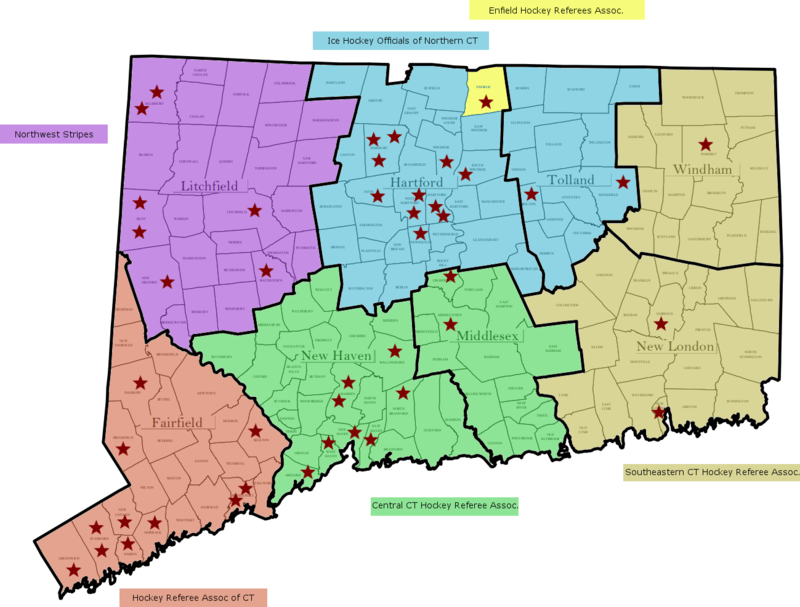 A map of the geographic regions served by the officiating organizations is below. Rinks are indicated by stars. If you are a new official, the map should help guide you on which officiating organization to join. A list of contacts for each officiating organization is below the map. You may join multiple officiating organizations to maximize the number of potential game assignments. Multiple youth hockey organizations may play out of the same rink, so multiple officiating organizations may assign games in the same rink. 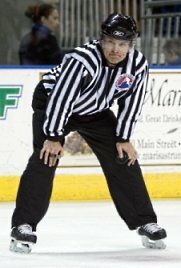 Rinks that are assigned by multiple officiating organizations include Shelton (HRACT and CCHRA), Trinity (IHONC and CCHRA), Cromwell (IHONC and CCHRA), Danbury (Stripes and HRACT), Wonderland of Ice (CCHRA and HRACT), and Webster Bank Arena (CCHRA and HRACT).